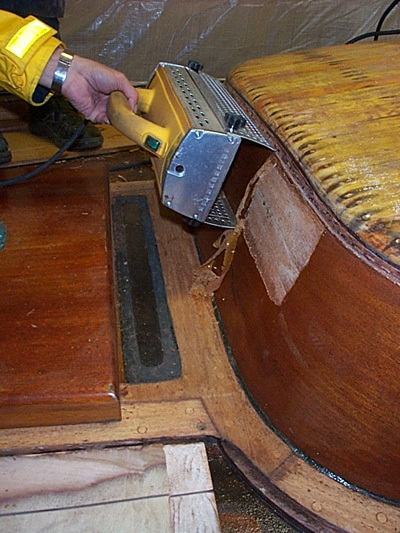 Paint Removal is usually considered to be a hard and boring restoration problem, involving many time consuming moments. We provide the market with Solutions for Paint Removal using a New Technology from Sweden which make Paint Removal fast and easy. Here you find information of the Speedheater Infrared Systems, all with the unique safety, better result, cost-effective, gentle to the wood and environmentally friendly benefits. 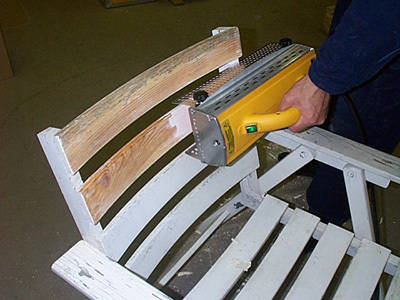 The Speedheater Method is the environmentally friendly paint removal solution. The Speedheater Method is kind to wood and is recommended by the National Heritage Boards in Sweden, Norway and Finland. The Speedheater 1100, IR Paint Remover uses only 1100 W despite its efficiency, which is extremely energy-efficient compared with other paint removal techniques. A renovation using the Speedheater Method enables a closed environmental system. By first laying a tarpaulin under the work surface, it is easy to gather up the dry paint scrapings - which can contain environmental toxins - and deposit them at the local environmental station in accordance with local regulations. The Speedheater Method is free of environmentally harmful chemicals. Many paint removal chemicals are harsh on the wood surface, skin, airways and natural environment. Removing paint with the Speedheater Method ensures a good working environment, as the benefits of IR technology include silence and freedom from vibrations. You never know what you could come across during a renovation project, so it's essential always to take great care, ensure good ventilation and/or use the appropriate safety equipment. For instance, flakes of old paint could contain lead, which when released turns into particles and becomes harmful either in the form of dust or fumes. 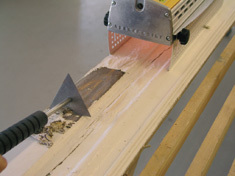 Removing paint with the Speedheater Method means a dust-free working environment where any harmful substances remain in the leftover paint, unlike other techniques which cause vibrations or particle release, for example. 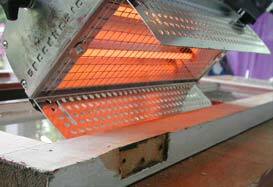 The low operating temperatures of the Speedheater Method, 100-200°C, are not hot enough to turn lead into gas (which happens at around 400°C). Tests we have conducted on fumes when removing old paint from wood and carpentry, show that in normal use no harmful quantities of smoke gases are released. Even so, paint fumes can always contain substances that are hazardous to health, which is why you should always ensure good ventilation/air exchange and/or use a protective mask. When removing factory-applied paint, a protective mask must always be worn. When removing two-component paints and varnishes, epoxy-based finishes and boat hull paints, a protective mask must always be worn. Extra care should always be taken when working indoors, and we recommend that a protective mask or a fume extractor always be used. The Speedheater unit is mainly made from recyclable materials.